The students in the Aerospace Enterprise and their faculty advisor, L. Brad King (ME-EM), are preparing to launch their Oculus satellite, which was designed and built by students. 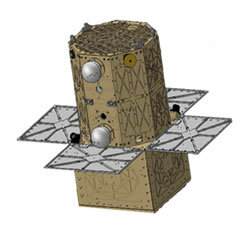 According to SpaceX, Oculus will be the first small satellite ever deployed from the Falcon Heavy. The launch information is available on SpaceX’s website. If you scroll down to “The Mission” you will see a title bar below it with Oculus listed. Sure signs of spring in the Copper Country are robins returning, ice leaving and Michigan Tech’s Engineering Ambassadors (AE) inspiring students. For the eighth year, the engineering students that make up EA will visit local elementary and middle schools to create excitement for engineering disciplines through programs and hands-on activities designed for students in third through tenth grades. Nancy Barr, professor of practice in engineering communications, said the Ambassadors present a 10-minute talk on a science or engineering topic to a classroom. Following the talk, the EAs engage students in a fun, 30-minute activity designed to reinforce the concepts presented in the talk. Each talk and accompanying activity are geared toward a particular age. Jaclyn Johnson (ME-EM), advises EA, while Barr provides training on presenting science to young audiences and then offers feedback on their presentations. The program, modeled after a similar program at Penn State, was started in 2012 by Michele Miller (ME-EM) a research professor and Danise Jarvey, director of academic services in the School of Technology. 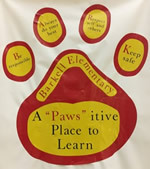 This spring, nine different AEs, working in pairs or groups of three, will visit two third-grade and three fifth-grade classes at the Barkell Elementary School in Hancock and four classes at Houghton Middle School. The program will run through April 12. More information can be found on the Engineering Ambassadors webpage. 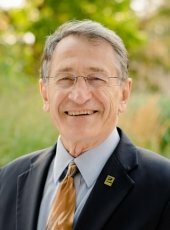 Dr. Darrell Robinette has been selected to receive the 2019 Society of Automotive Engineers (SAE) Forest R. McFarland Award. This award recognizes individuals for their sustained outstanding contributions toward the work of the SAE Engineering Events in the planning, development, and dissemination of technical information through technical meetings, conferences, and professional development programs at SAE events or outstanding contributions to event operations in facilitating or enhancing the interchanges of technical information. Established in 1979, this award is administered by SAE Engineering Events and honors the late Forest R. McFarland who was himself an outstanding session organizer, a chairman of the Passenger Car Activity, and a member of the Engineering Meetings Board. Funding for this award is through a bequest by Mr. McFarland to SAE and consists of a framed certificate to be presented at the 2019 SAE World Congress on Tuesday, April 19, 2019. Darrell Robinette (ME-EM), faculty co-advisor of the SAE/GM AutoDrive Challenge Team at Michigan Tech, served as a speaker and panelist in the plenary “Empower” that discussed the various digital tools with which mechanical engineers are now expected to be proficient and the effect they will continue to have on mechanical engineering education. William Predebon (ME-EM), J.S.Endowed Department Chair, was presented with a Certificate of Recognition for his commitment to engineering education and continuous service to the society. The honor was presented at an Awards Luncheon hosted by the ASME Engineering Education Awards Committee. Predebon has been involved with the ASME Committee on Engineering Education for the past 20 years, serving as VP and Chair of Engineering Education, and continues to work closely with the committee in an effort to further mechanical engineering education at all levels. Nancy Barr (ME-EM) presented an overview of the the ME-EM Department’s undergraduate portfolio program as part of a panel at the Council on College Composition and Communication (CCCC) annual convention. The panel, titled “The Performance of Portfolios Across the Curriculum,” highlighted the use of portfolios in undergraduate program assessment and student development at a range of universities. 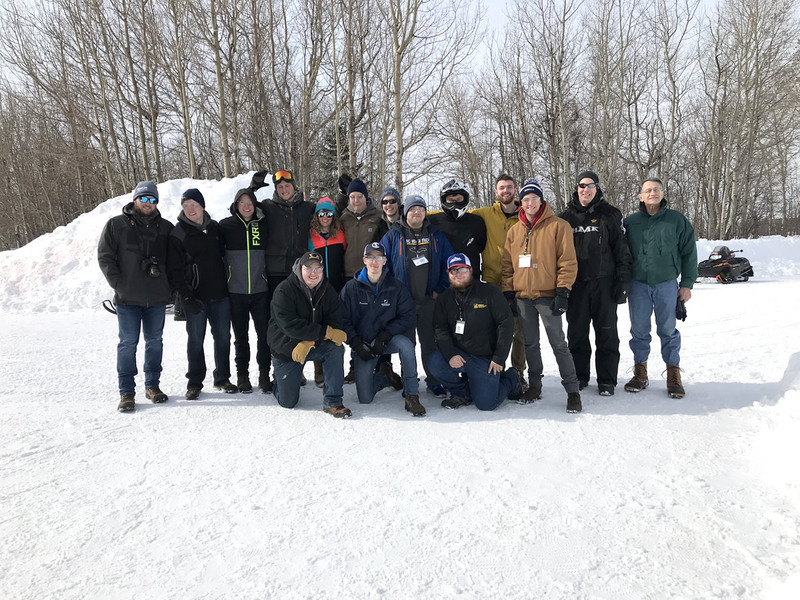 The 2019 Conference on College Composition and Communication was held March 13-16 in Pittsburgh, PA.
Michigan Tech fared well in the 2019 SAE Clean Snowmobile Challenge (CSC) held March 4-9 at the Keweenaw Research Center. There were 22 university teams competing this year from the U.S. and Canada, 13 in the Spark Ignition Gasoline Class and nine in the Compression Ignition Diesel Utility Class. The teams came from as far east as Clarkson University and as far west as Idaho University. The Michigan Tech CSC team took first place in the Combustion Ignition Diesel Utility Class. They received a trophy and $1,000 prize, sponsored by Oshkosh. The team received one of the Can-Do E-Controls Innovation Awards with the prize of $1,000 in value products. The Michigan Tech CSC team also earned the Most Sportsmanlike Award ($1,000 sponsored by AVL) as recognized by the other teams. 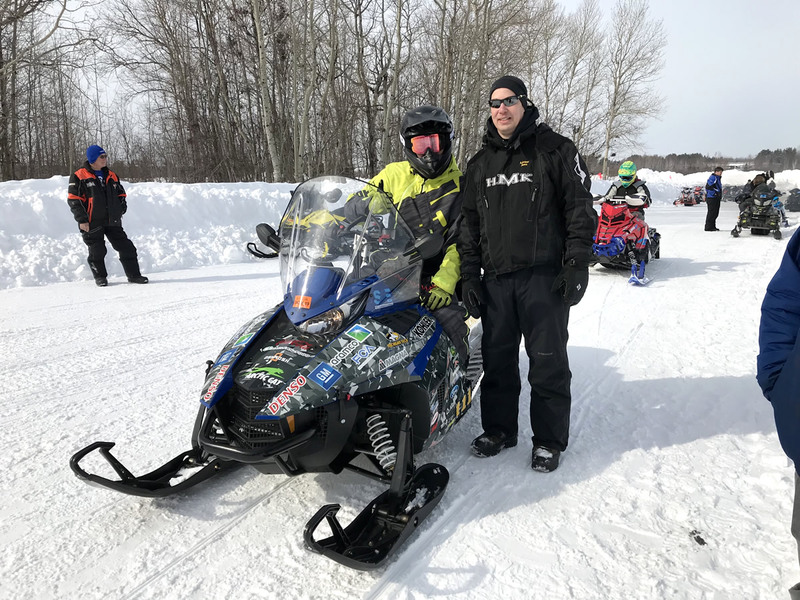 In the Spark Ignition Gasoline Class, the Michigan Tech CSC team received the Polaris Best Handling Award. They also received a MSA Award Plaque for Endurance, having completed the 100 mile endurance and fuel economy event. By Mechanical Engineering-Engineering Mechanics. Photos by Janet Callahan. The 2019 Rekhi Innovation Challenge ended Feb. 28. This year there were seven teams competing. The Rekhi Challenge is a crowdfunding competition to help promote and support student innovation and entrepreneurship through Michigan Tech’s crowdfunding site, Superior Ideas. A total of $3,035 was raised between the projects. 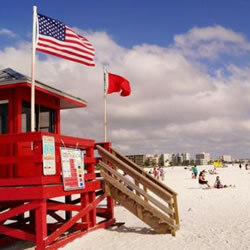 Congratulations to the Automated Beach Safety Flag project for raising the most at $2,245. This project team will receive a matching gift of $1,000. The Audio to Visual project won a total of $100 in prize money and the Automated Beach Safety Flag project won a total of $1,150. Thanks to all of the donors that contributed to these projects. Your support for student innovation and entrepreneurship at Michigan Tech is greatly appreciated. Mayank Bagaria is a mechanical engineering graduate student. Lisa Casper is the program manager for the Innovation Center for Entrepreneurship. 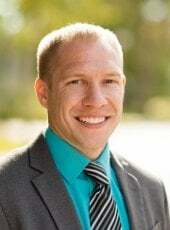 Andrew Barnard is an assistant professor in the Department of Mechanical Engineering-Engineering Mechanics. Michigan Tech’s Advanced Power Systems (APS) lab was one of the cover stories in the January edition of dSPACE Magazine. The story “Efficient Platooning,” begins on page 22, and features quotes and a photo of Christopher Morgan (ME-EM). There is also a video link in connection with the story. “The purpose of the project is to use upcoming technologies, such as automated vehicles, V2I, V2X, and sensors, to improve energy consumption on modern vehicles,” says Chris Morgan, Operations Manager at Michigan Tech. The ME-EM Senior Recognition Banquet and Order of the Engineer Program was held on December 11, 2018. 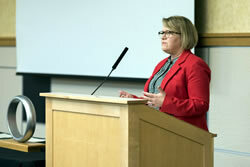 The speaker was Heidi Mueller, Supervisor – 2.3L GTDI Engine Calibration, Ford Motor Company. John Hoffman is a member of team 64 working on Laser Welding of Carbide Saw Blade contracted with Milwaukee Tool. His team’s advisor, Steven Ma, said that during the year working on the project John Hoffman has continuously shown graduate level skill in multiple areas of our senior design project in software/coding, CNC control, fixture design and hands-on machining and made great contribution to the success of the project. Although the whole team has worked well together and each individual contributed quality work, the project would not be at the point where it is currently without John’s knowledge, time, and commitment. His outstanding performance during this Senior Capstone Design project has been well recognized and is therefore nominated here for the Outstanding Student Performance Award. Cam Hadden nominated Thomas Richter for his outstanding work on Team 59’s CAD model of the seatframe, as well as the work he has done with FEA. I believe that without his contribution, the team would not have nearly as impressive of a final presentation. From what I understand, he has done most of the modelling work by himself during semester 1, and he has done ALL of the FEA work by himself during semester 2. His FEA models are very impressive, which include not only stress analysis but also mass optimization for weight reduction… These were apparent in the team’s final presentation. Nominated by Forumla SAE Advisor Jim De Clerck, Cora Taylor joined FSAE early in her college career. She has been involved in nearly every aspect of vehicle development and team operation. As team President, Cora proved that she could be counted on to get things done. Last May, Cora led the team through one of our most outstanding competition experiences ever. 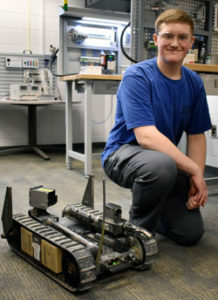 The School News Network ran the story “Bomb-defusing robot gets tweaked at Tech Center mechatronics lab.” The story focuses on the work of Rockford, Michigan high school senior Jared Rathburn, who is planning to attend Michigan Tech to major in mechanical engineering. It’s not your average high school shop project. At the Kent Career Tech Center mechatronics lab, senior Jared Rathburn is modifying a bomb-defusing robot. About the size of a backpack, the rubber-treaded “Packbot” is able to scoot across a room or field, open a door and pick up an object with a hand-sized claw. The Rockford High School student spends a couple of hours most afternoons learning advanced robotics skills at the mechatronics lab. After graduation, Jared says he is headed to Michigan Technological University in Houghton, where he plans to study mechanical engineering. Read more at the School News Network, by James Harger.